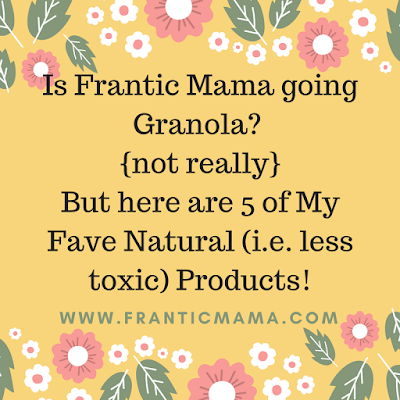 I'll probably never be the Crunchy Granola type (I love me a little glamour! ), but I am trying to eliminate just some of the more 'dangerous'* chemicals in our house and bodies [despite the fact my husband thinks I'm a little crazy]. 1. Better Life Automatic Dishwashing Detergent. I love this soap as much as one can love a dishwasher detergent (which isn't a ton, I suppose, because how much can one love dish soap?). It isn't very expensive, and it smells a million times better than the store-brand, chemical-laden, surely toxic gel we had been using for years. YEARS! And yes, it really works, better in fact, than our old one (but do note, I am a rinser). Making the following switches has been no small feat for me. I expect a lot from a daily face lotion and a sunscreen. It needs to be light but moisturizing, it needs to be non-comedogenic, and ideally, it needs to contain SPF. Oh, and now it needs to be paraben-free. My new favorite daily face lotion with SPF so far: MD Solar Sciences Daily Anti-Aging Moisturizer SPF 30: It's paraben-free, contains natural fragrance (lavender), contains no mineral oil, and most of their products are highly rated by EWG (Environmental Working Group). I am currently using this chemical-based face lotion/sunscreen and lurve it, but I'm eventually going to try their mineral-based ones too, as I know those are probably better for my skin (sigh...). One mineral-based sunscreen I love for the kids and me: Rodan and Fields Soothe Mineral Sunscreen SPF 30. This lotion is fantastic. It contains physical blockers-- zinc and titanium dioxide-- and is paraben-free and fragrance-free. My son's skin is is ultra-sensitive and this is the ONLY sunscreen that doesn't ruin our lives when we are on vacation or during summer months when we are outside a lot with a high UV index. 3. Here's a little natural treat to mix into your routine: Juice Beauty Green Apple Hand Cream. This cream feels fresh and clean, and the list of ingredients doesn't look like one you would find in a chemistry lab. Enough said! I was introduced to the Norwex brand last spring when a friend of mine hosted a party. I was surprisingly quickly on board with their products, even though I am not a cleaning fiend at all [it's hard for me to get excited about cleaning!]. Part of the reason I've always hated to clean is the strong chemical scent of so many cleaners, so my favorite Norwex product is their EnviroCloth. You use it with just water and it cleans your surfaces really well-- no chemicals needed to get rid of 99% of bacteria! They also reduce my paper towel usage. The wool "Fluff and Tumble" dryer balls are awesome too; they soften clothes in the dryer without the chemical-laden dryer sheets I had been using my whole life. Either way, an easy switch has been to use these 9 oz. Life Factory Glass bottles. ** These bottles are dishwasher safe, hard to break due to their silicone cases, and easy for little hands to open and close. **Now please excuse me while I take out a second mortgage to pay for all these switches. What are some of your natural faves these days? *When I say 'dangerous,' I basically mean products containing known carcinogens or toxic materials that can leech into our food or bodies. I'm sure none of these products are perfect, but they have definitely helped me feel just a bit better. Have you written any articles or blogs on vaccination,what is your stance?